Nearly every small business owner has heard how social media can be a great tool for marketing their business and reaching customers online, but most don’t know how to get started or have the time to keep up with an active presence. However, many social media platforms, like Facebook and Google My Business, are constantly working to make it easier for businesses to claim and manage their page. And, once you get started, you can start sharing promotions, post valuable/educational content, promote your services, highlight new products or features, share photos and videos, showcase reviews, and talk to customers. The best social media campaigns are tailored to fit your business, connect with your audience, and work toward your overall marketing goals. Here’s how you can make the most of your social media presence. How do I get started on social media? This is the first step to creating a professional social media presence for your business. First, check if you have existing unclaimed profiles. You can usually claim these listings by verifying your affiliation with the business over the phone or submitting official documents. Once you have access to your listings, make sure the business name, address, phone number, hours, and information are correct and consistent with your website and online profiles. Add a profile picture and cover photo that represent your business, and upload high-quality photos. On Facebook, make sure you add your services, a call to action button, and any specials or promotions you’d like to feature. The process of claiming and optimizing your profiles can be time consuming, so you may want to consider using a social media and/or digital marketing agency to help you. A full-service agency can often provide assistance with the verification process and help optimize profile pages. Who should manage my social media profiles? 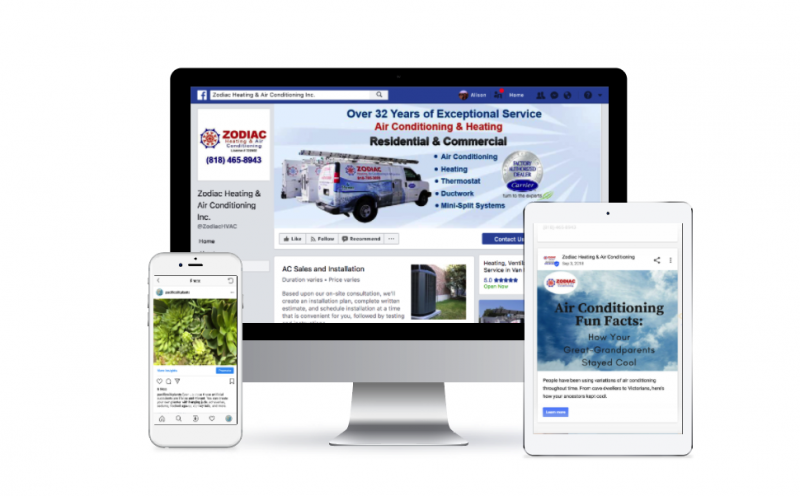 When your social media profiles are set up, your business’s current and potential customers will be able to ask questions, request quotes, ask for customer assistance, and leave reviews. For these reasons, it is a good idea to have someone in your company monitoring the page to make sure you respond to these inquiries quickly and accurately. Additionally, it gives you another platform for you to find and connect with customers. If you’d like ongoing support with monitoring and managing your social media profile(s), consider using an agency to monitor and update your pages. Posting regular updates keeps your audience engaged and helps them keep your business in mind. However you also want to be careful to not exhaust your followers with useless information or constant sales pitches. So, it’s important to maintain a balance of promotional and useful posts that support your overall marketing goals and bring value to your customers. So, amix of posts about new products and services, specials, interesting photos, informative blog articles and exclusive or behind-the-scenes content is ideal. If you don’t yet have any followers, you can use paid advertising on social media to help you reach a targeted audience in your service area who may be interested in your services. Advertising on social media can require lots of adjusting to get the most value, so make sure your ads and target audience are fully optimized before diving in. You can either have someone in your company creating posts, or outsource content creation to an agency that offers quality social media services. The benefit of having someone in your company create posts is that they will know first hand what your business wants to promote, and they will also have access to your photos and content. If they are experienced with advertising online, they may be able to set up ads on Facebook, Instagram, or other social media platforms. If this feels like too much pressure, let an agency manage your organic and paid social media presence. This can require an initial time investment to convey your goals, pass on photos and graphics, and share the specials or services you’d like to promote, but after this first step the agency will be able to create content and schedule posts for months in advance and run optimized ads to reach your target audience. You won’t have to worry about posting regularly or figuring out what to share, and your customers will benefit from receiving useful content from your business on an ongoing basis. 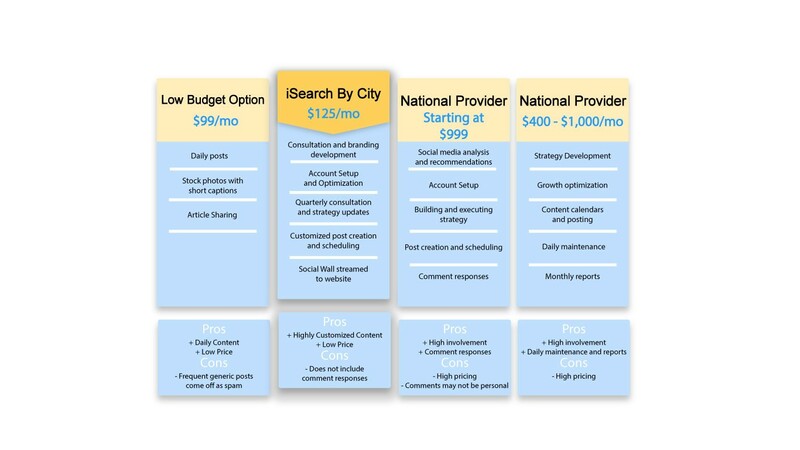 How much should I spend on social media services? Social media services range greatly in price, depending on the provider and level of service. High-end social media packages can often reach up to thousands of dollars per month, and may provide additional features that aren’t necessary for your social media goals. While low budget packages may seem like a good idea at first, they generally do not have the resources to tailor content to your business and create valuable posts, and many businesses find that these types of services produce spammy content. Finding a package that’s the right fit for your business can make a big difference, so make sure the agency you choose understands your business and its marketing goals. iSearch by City provides customized social media packages at competitive prices to give businesses a strong presence online. We also offer fully search engine optimized websites, professionally written, keyword rich copy, and listings across multiple directories. We work with each of our clients to develop a website and marketing plan that best represents their business, and provide free consultations to new clients. Visit our website to learn more.